How to perform minimum stay? Please go to the upper menu of HotelRunner panel and click Calendar / Basic Updates calendar respectively. Since the price and availability types differ from each other for minimum stay, you must perform the related actions individually for each channel. After selecting a channel from the pop-up window, click Continue. 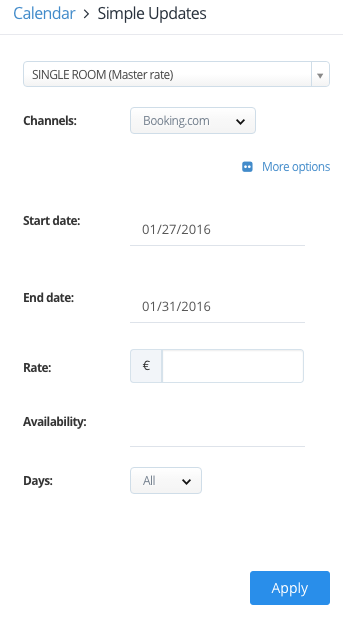 Please first select the room type you wish to assign minimum stay from the left hand side of calendar field, and then specify the start–end dates you wish to apply minimum stay. Finally, click on the More link on the right-hand-side of the channel you have selected. The pop-up window includes your room types available on the system, as retrieved from the channel on the left hand side. You must specify minimum stay for any individual room. After selecting the room type from the left hand side, please determine your minimum stay value and then click OK. Please check your actions from the pop-up preview window and then click Update. After the channel update is complete, you can check your action by selecting the checkbox for the Show Limitations field on the upper right of Basic Updates calendar. Please check Minimum Stay from the left hand side and select the dates for which this action is applicable. Please determine the minimum stay value for the room you would like to perform an action for from the minimum stay fields appearing in the center. From the right-hand field, check the channel list and then click Update.